Stephen, you need to resign immediately. This is absolutely unacceptable behavior from someone running a major media source in the East Bay, or anywhere. You are apologizing while still being vague about what you did. A genuine apology wouldn't be so vague about what you are apologizing for. Did you refer to someone when you used the word? Did you use the article as an excuse to use the word multiple times unnecessarily? Proceed with extreme caution calling for boycotts or divestiture. A newspaper is not like a restaurant. We could end up with the Express getting sold to an owner who turns the EBX's local news coverage into the pablum of the Patch. But: what would "resigning" mean, given that he's the paper's owner? He could hire a publisher and step back from that role, but he'd still be the owner. Otherwise, it would mean a sale, and I wonder if there would even be any buyers. I'm not arguing for or against anything here, but this is what has to be considered if you're going to call on the guy to "resign." It's heartbreaking to see this outcome. As a reporter at the Express in the mid-00s, Steve's interactions with me as editor in chief were nothing but professional, supportive, and motivating. He was a mentor and an example of what a journalist utterly devoted to serving his diverse and complex community looks like. While I can't speak for anyone else, of course, I can say that I am honored to have worked for him and shocked by this turn of events. Of course, I can't speak for anyone else's direct experience, but here is mine as a white male. I worked directly with Steve as a journalist at the East Bay Express for 10 years. During that time he hired and supervised many women and people of color, some of whom I watched launch successful careers in journalism with his direct support and guidance. Not once in that decade did I hear or see anything blatantly inappropriate occur between him and any of his employees. That's not to say nothing ever happened, or that I'm privy to the full story here. Now Steve has resigned after making some serious mistakes. But why all the vitriol toward a man who has dedicated his life and career to local independent journalism and to Oakland and the East Bay, a person I've known to openly acknowledge the limits of his understanding and to work to overcome them, even if he didn't always succeed. At the Express I also knew him as a journalist who spoke truth to power, and an editor/owner who was not afraid to accept responsibility for his mistakes and for those working under him. I recommend that all of you who don't know Steve, who never worked at or for the Express, who are not personally involved, yet are so quick to judge, please take a deep breath before you condemn him and/or call for the destruction of the Bay Area's strongest voice of independent journalism at a time we desperately need it. Some serious perspective is in order. "Cruel caricature" — or the fact you were called out on social media for things you did? There is a difference there. You have no credible defense. You need to more than resign. I'm calling for a BOYCOTT of this paper and the other properties. You're still the OWNER. - And, most famously, the exposé of the brutality of the Bey family, which operated with impunity and support from local politicos until the Express shined a lot on its shady operations. There are more examples and I encourage others to share them. Harper, you're on the absolute wrong side of this. Please, keep telling us how painful this is for YOU. Feel free to challenge anything I wrote on the same medium instead of here, but remember to include how much you were or weren't involved. And for all those who care to read about my and many other women's versions of Buel's legacy: https://twitter.com/kkelkar/status/1018264067008532481. Have an extensive network of regular, quick ferries services which crisscross the bay tied into excellent terra firma public transport links. If Sydney, Auckland, and Brisbane (cities where lifestyle, culture, and modern car transport are similar and they have less urban density) can manage it, why can't the Bay Area? The ferries remove the biggest bug bear of transport planning, 2 trip daily commuters, use many times less carbon, create lots of long term great jobs for the crews and support staff and gives an amazing experience twice daily to people who are simply going to work. The reduction in stress alone will add to people lives. Thank you for this thoughtful article on a critical topic for our region. I hope the focus on Richmond does not give people in North Berkeley, Albany, El Cerrito, and Kensington a false sense of security. I find that few people outside the health-care field are aware that there is no longer a "cath lab" at Alta Bates, so a heart attack or a stroke requires an ambulance trip to Oakland. The freeway corridor and the streets en route are increasingly clogged year by year. Land use plans for the region call for dramatically greater density — but not for any new hospitals, let alone emergency rooms. The trends for emergency care, hospital access, and health-care costs are all extremely troubling. Although the task force Berkeley Mayor Jesse Arreguín chairs does good work, it does not yet come close to providing the robust public/private, intergovernmental, regional response that will be needed to restore emergency care and other hospital services, and to return a functioning health-care market, to our region. If you are concerned, please urge your elected representatives to make this a top priority. There are so many issues, large and small, that grab public attention, but this is a major failure of one of the most basic functions of government, and it requires serious and sustained focus. As a professional accordionist and teacher who's patronized this shop for many years for himself and for his students, Smythe is very competent, reasonable, and honest. I love the accordion — have two of them — played as a child, now I am 63 and play for myself to keep my skills. I love Alex Meixner — he has his own band — he is one crazy dude trying to keep the accordion alive. I met him in Texas at the Wurstfest in New Braunsville and I go back to see him perform every year. In our July 11 Eco Watch, "Cut Off?," we misspelled Ben Kaufman's last name. 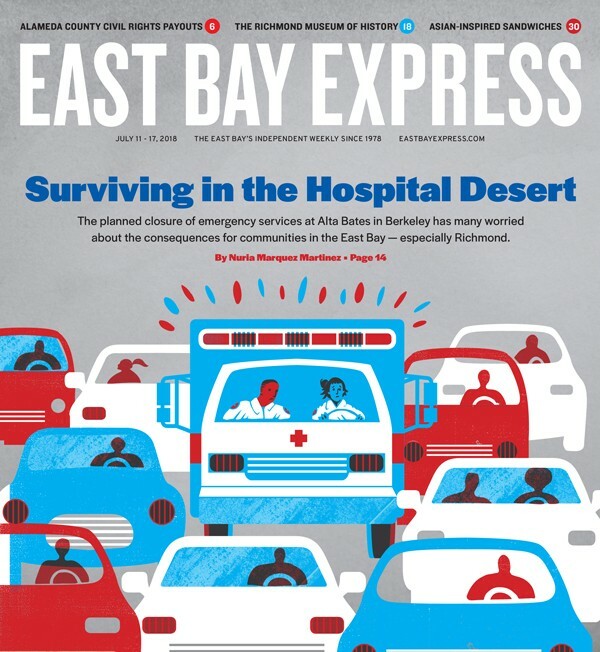 In our July 11 Feature, "Surviving in the Hospital Desert," we got wrong Clayton Warren's title; he is communication manager with Sutter Health, not its communications director.